40 year old hospital theatre orderly Steve, has spent the last 20 years travelling the world. After a substantial win on the lottery, he decides that it is now the right time to settle down in one place. When he meets Liesel by a chance encounter, in the hospital canteen, it is love at first sight. During their first meeting, Steve asks a surprised Liesel to go house hunting with him. Whilst viewing a property that they thought was okay, the deal clincher is that it has a cellar hidden away. Steve purchases the house, telling Liesel that she can move in with him. This is the start of their relationship. Both have ambitions in life, and neither wants children. That is until Liesel meets her friend’s baby and becomes broody. With Steve unwilling to budge in his thoughts about having a child, Liesel gives him an ultimatum. Change his mind by Easter, or she will leave him. This forces Steve to take drastic action. 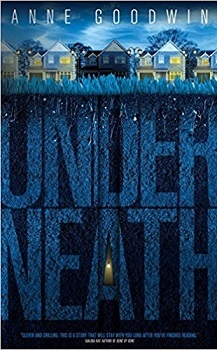 I got to the end of ‘Underneath’ and questioned everything that I had read. This is a twisted dark psychological book, one that does play with your mind and has you wanting to know more. Unfortunately, it played that well that I got to the end and hadn’t a clue what had gone on. It is written in the first person, Steve’s point of view. What I presumed he had shown us happened in parts, turned out often not to be the case. Then we have the back and forth to his childhood that is written without warned, just a jump from the present to the past, and back again. The main characters are both deeply damaged by past events in their life, and both had very unusual personalities. I really couldn’t warm to either of them, or any of the other characters in the book if I’m being honest. Their relationship had ‘doomed’ written all over it from their first meeting. The book isn’t split into chapters, but rather six long sections, each opening with a page of Steve’s thoughts regarding someone he has locked in the cellar, though we are left to wonder who. We do get to know that it is a woman. I just didn’t get it. I think this is the first time I have ever finished a book and gone, ‘what on earth happened’. There either wasn’t enough information to process what was truly happening, or there was too much information, which in turn obscured what was really going on. I’m sorry, but this really wasn’t a book for me. Anne Goodwin loves fiction for the freedom to contradict herself and has been scribbling stories ever since she could hold a pencil. During her career as an NHS clinical psychologist her focus was on helping other people tell their neglected stories to themselves. Now that her short fiction publication count has overtaken her age, her ambition is to write and publish enough novels to match her shoe size. Her debut novel, Sugar and Snails, was published in July 2015 by Inspired Quill and shortlisted for the 2016 Polari First Book Prize. Her second novel, Underneath, was published in May 2017.